Location – The close proximity of Hyde Park to Orlando is a major benefit to being a resident of our community. Located just 13 miles west of the city in peaceful Winter Garden, Hyde Park is just minutes away by car from world-class amusement parks, fine museums, professional sporting venues, bustling shopping malls, state-of-the-art medical facilities, and restaurants of every culinary stripe. Orlando International Airport is just a short drive away, as well. Amenities – Few other independent living communities in the Orlando area have amenities that are on par with those at Hyde Park. Residents of our 55+ community enjoy access to a spacious clubhouse, heated swimming pool, hot tub, library, billiards room, bingo hall, shuffleboard court, picnic area, garden sitting area, RV and boat storage facilities, gated entrance, and more. Housing – The streets of our 55 and over community are lined with quality crafted pre-owned homes available in a variety of lot sizes and prices. All homes feature updated name brand appliances, central heat and air, low maintenance exteriors, and more. Lifestyle – Hyde Park is a 55+ community that is designed to foster the active retirement lifestyle. Our residents are drawn together by a shared desire to have fun, stay active, and be happy during their retirement years. 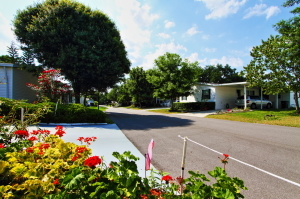 For more information about Hyde Park – and why it is rightly considered to be one of the top independent living communities in the Orlando area – please contact us today.